That’s what the woman said who booked my trip to do rock climbing in Yangshuo, China. I was there for the Hari Raya holiday and had made friends with a German girl “S,” and a guy from New Zealand “P.” We had all decided to do rock climbing together and then go river rafting. S was also a beginner, but P had climbed many times before. When we got to the rocks, we had to put on special shoes made just for climbing. These bent your feet so that you could cling to small crevices in the rock to lift yourself up. We also had to be attached to a harness which was attached to a rope. This was our life line in case we were to fall. The first rock we climbed was a 5.7. This was a relatively easy climb and all three of us were able to make it to the top. Of course, P was the fastest. The next one was a 5.8. P made good time going up. S took longer. I was last, and I made it up with a lot of effort. It felt challenging to me, but I could still do it. Then things changed. The instructor wanted us to do a harder climb “Just to try.” This was a 5.9. P was barely able to manage it. If P found it so hard, how would the rest of us do? S made it up some of the way because she was quite tall and could reach a portion of the rock that was quite high. I could not manage at all, that piece of rock was too high for me to reach with my short legs, and that was the only way to progress on the rock. Now, if you were the instructor what would you do? 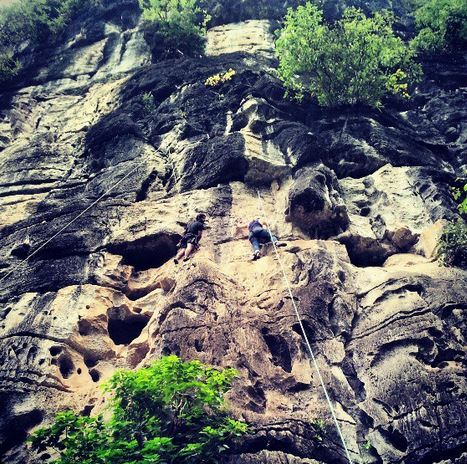 You have a class of mixed ability, and you have a rock face with different abilities of climbs. How would you arrange the next climb for the three students? Let me tell you what my instructor did, and the results of it. The instructor gave us another 5.9. P struggled, S struggled, I couldn’t do it. This left me discouraged and with bad feelings towards my instructor and potentially towards climbing. I felt embarrassed that I couldn’t do the climb, and I felt bad because I was here for the same reasons as the others: I wanted to climb. Yet, They got to climb 4 times and I only got to climb 2. What should the instructor have done? He should have observed our levels and let us climb at the appropriate level for our ability! This is classic differentiation. He saw that the 5.8 was challenging for me. So, he should have asked me if I would like to climb the 5.8 again or if I would like to try the 5.9. Even if he asked me to try the 5.9 once, if he saw I could not do it even with support, he should have let me climb the 5.8. It was challenging enough for me that I would build my confidence and strength climbing at that level. If I was another type of person, I might give up on climbing after this experience. This is like how we should approach differentiation in our classrooms. We have students of mixed ability, so how can we think of giving them all 5.9 work? Some of them might be challenged with 5.7 or 5.8. Or maybe they can climb a 5.8 but with extra support. Equipment– what tools do the students need to succeed at the task? Do all students need the same tools? What about students with special needs? Ability– what are the abilities of the students? How can we adjust the activity to meet the needs of students with different ability levels? Support– how can students be supported to achieve their full potential? Life line– if a student falls, what system is in place to get them back on track? The facilitator is holding the rope, and keeping the student from falling. What is the rope for our activity? How do we keep the student from falling? Would it be extra after school support? A talk with the parents about extra at home practice? I hope this story has helped shed light on the need for differentiation in the classroom and given you ideas for implementation. 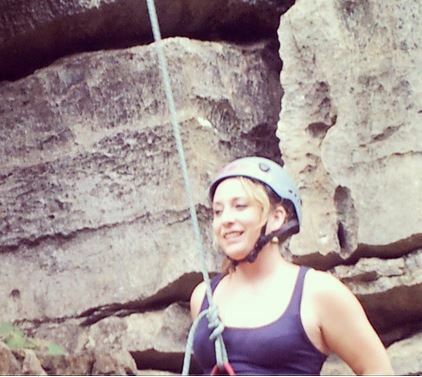 At least my embarrassing rock climbing experience has an interesting moral. Can you imagine doing a recycling demonstration with 60+ students and having 90% giving you their undivided attention? Well I am happy to say that it is very possible! On Friday, I did a paper making demonstration with 2 classes of year 2 students. They came to an empty classroom where I had the materials set up. They learned to vocab words (recycle, frame, screen, paper, glue, pulp, blender, blend, dry, etc.) and then watched as I turned old newspaper (they had brought in) into new recycled paper. First thing, I taught them the 5 rules as I always do. I taught them how to respond when I say, “Class.” They know they need to say, “Yes” however I say, “Class.” While I was teaching, sometimes I would see a few students start chatting or look away. I would quickly say, “Class,” in a silly way and they would respond with “yes.” I now have 100% attention. Then I ask a question to the kids who were off task (surprisingly, they could usually answer correctly which means they weren’t completely distracted), and then move on and continue with the demo. By the end of the class period, all students could identify the vocabulary words, put them in a sentence and put the paper making process into sequential order. With 60+ kids in the class I thought this lesson would be a disaster, but it goes to show that when kids are taught your expectations first thing and when you consistently enforce them, behavior problems decrease exponentially. The scoreboard helps the kids to monitor themselves. It’s very simple, and practical. You have a smiley face and a frowny face divided by a line. When they are following the rules, you give them marks by the smiley face and they can cheer. When they are not, you give them marks by the frowny face and they must groan. Simple and effective. Like independent reading, when it comes to writing Malaysian students typically cannot write anything they haven’t already seen first. Sentences are copies from texts, and students find it very difficult to write their own sentences. “Work on writing” forces them to try to write on their own. Like “read to self,” “work on writing” had to be modified to meet our n eeds. As necessary we use MT to explain the concept. We need to make sure they know and understand the procedure. We also want them to have ownership of it (by brainstorming and displaying our anchor chart). When explaining “work on writing” I emphasize that they need to use their brains. We all touch our heads and turn on our brains. We need to think up our own words and sentences. Students without the ability to write in sentences usually try to make lists. We talk about different types of lists (grocery list, list of favorite animals, etc.). They gain confidence from the idea that they have the ability to write lists, and eventually will be able to do other kinds of writing. 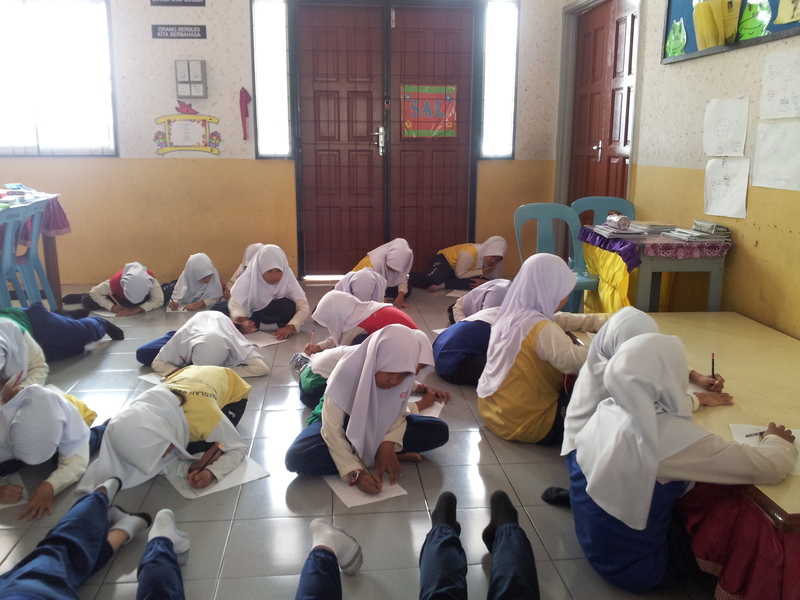 Learning those other types will come gradually with “mini-lesso ns” during work on writing time. I have to say, I was amazed that the improvement in independent writing that I saw within only one class period. Being encouraged to write without the aid of textbooks forced them to put their thinking caps on and write from memory. 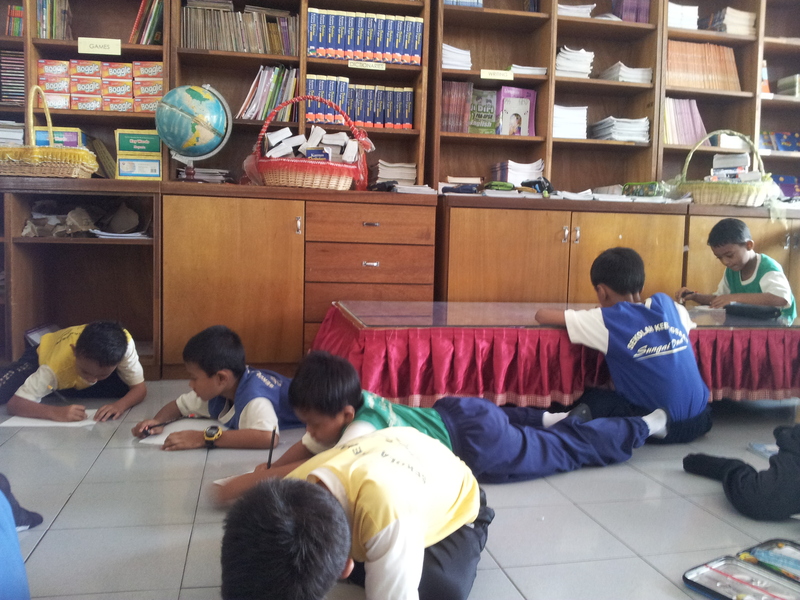 In one class, we practiced for 2 minutes perhaps 5 or 6 times. The first time, some students could only write 1 or 2 words or none at all. But the 6th time, they had written a coherent list. It just takes practice! I’ve noticed here that when children read, it’s very much like mimicry. They can repeat back a text that they have heard. Maybe they can answer simple comprehension questions with guidance. However, they do not read for fun or draw any comprehension from a text they have not been guided on. At least not in years 1-3. The interesting thing, is that when you ask the children if they like reading they emphatically say yes. 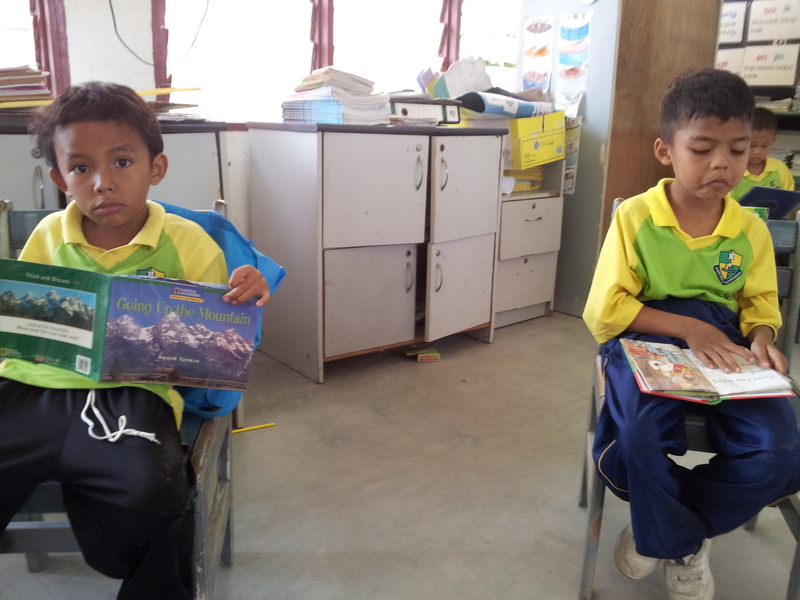 They love books, they love to get their hands on books. But they have not been taught how to read for pleasure. They have not been taught the strategies to get the most out of their reading. “Read to self” teaches children to be independent readers. It gives them structure, tools and skills. It is great for the teacher as well, because not all teachers are comfortable with 1-1 work or small group work. The structure of the Daily 5 gives those teachers a very clear framework to go on. 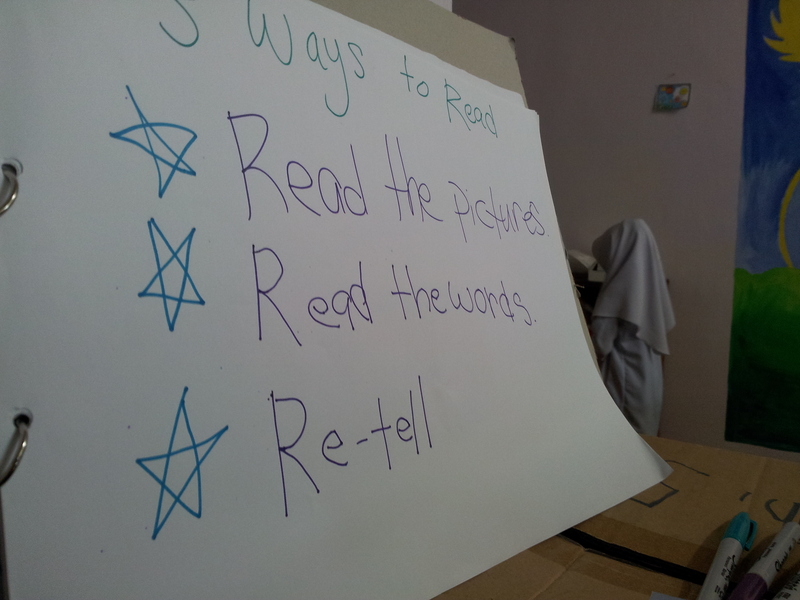 That being said, we had to modify some aspects of “read to self” for use in the Malaysian classroom. Our classrooms are shared, and do not have classroom libraries or materials to use. So, we discussed and decided that read to self could be conducted in the classroom if children used their “book bags” to get books from the library or SAL room first. This is dependent on children being able to choose “good fit books” and libraries and SAL rooms being organized. Otherwise, read to self takes place in the SAL room or Library and children choose books first and then begin read to self. The website “The Daily Cafe” explains how to teach “read to self” for the first time. We had to modify this because our students are all ELL (English Language Learners). Therefore, at first, we explain the procedure in English and the MT (mother tongue). How much MT is needed depends on the ability on the class. We want them to have ownership of the process so when we brainstorm we may ask them questions in MT, and then ask for answers in English. For example, “Why do we read? How does reading help us?” Kids can usually say things like, “smart,” or, “fun.” Then we write that down on our anchor chart. We get a lot of vocab out of these lessons that they will use continuously. I’ll attach a list at the end of this post. Another thing we have to modify is the timing. In other countries, Literacy blocks last several hours. We have 1-1.5 hours for a lesson. For this reason, we expedite the introduction and get right to practicing. It takes an entire lesson to teach the concept and start practicing. After that, I recommend the teachers decide how to structure independent reading time. Perhaps once a week, once every 2 weeks. Since there is just 1-1.5 hours per lesson instead of following the format that the sisters (authors of “The Daily 5”) recommend, they might do a whole group lesson, then practice “read to self” for 10-15 minutes. Since practicing “read to self,” we have started delving into conferencing and “CAFE” strategies. This is more complicated, especially for teachers who have never been exposed to literacy strategies before. I’ll update on this later on. 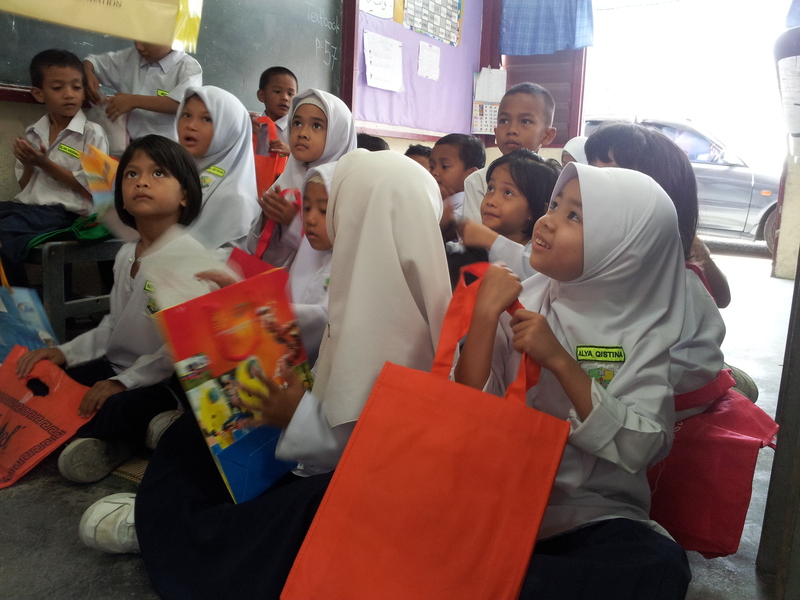 Children in Malaysia need to be taught responsibility. I’ve talked about this with many admin and teachers. You can see the affect on the country- reckless drivers, litter bugs, smoking around little children. In the schools it is evidenced by the lack of respect towards resources- literally destroying books, materials, spaces, etc. It’s not their fault, no one has taught them what to do. No one has modeled it for them first. 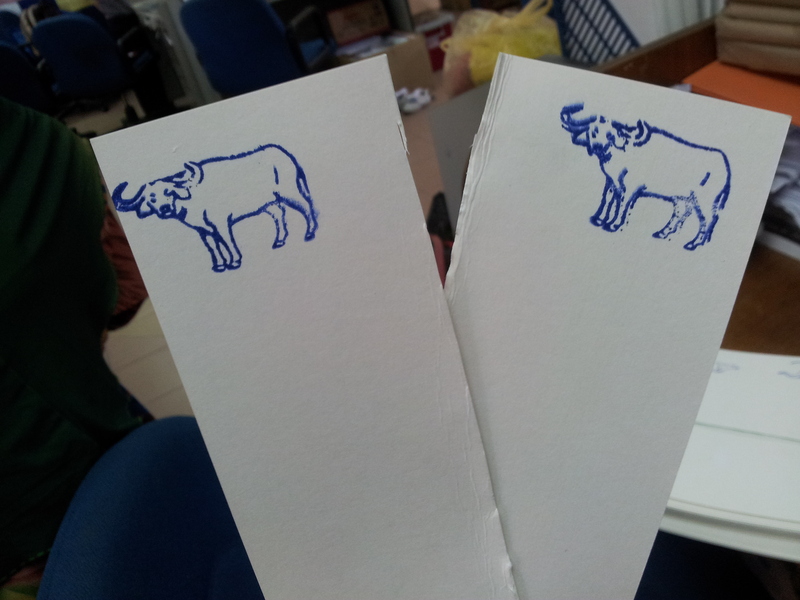 One simple change we have implemented at one of the schools is the book mark system. When a student takes a book off the shelf, they must take two book marks with matching pictures. They put on on the shelf where they found the book, and the other in the book. When it’s time to return the book, they find the matching book mark and put it back where it belongs. Simple, but effective. What is a resource? Dictionary.com says it is, “a source of supply, support, or aid, especially one that can be readily drawn upon when needed.” Does this describe the current state of our Libraries? Even our computer labs, media labs, SAL rooms and teacher supplies are not always utilized as the resources they are. This is mostly because they are not organized and maintained as they should be. There are setbacks. We don’t have staff whose purpose it is to maintain these resources. They suffer from the “tragedy of the commons.” This is usually applied to the idea that because our environment is “common space” it is not taken care of as it should be. This idea was first promoted by Garet Hardin. He said, “If a resource is held in common for use by all, then ultimately that resource will be destroyed. ‘Freedom in a common brings ruin to all. '” I think this idea also applies to our common spaces in the schools, because there is not a set system for management and maintenance. The job falls to everyone and so no one does it. 1. Organize! Make sure books are sorted and labeled properly according to type (ficton or non-fiction), reading level, and topic. 2. Maintain- make sure there is a system for children to know how to take, treat, and put back books. They need to be taught this system, and it needs to be modeled and reinforced. 3. Use- Use the library for the resource it is! Pull out books that go along with the topic you are teaching and use them in the classroom. Use the books for “daily 5” activities. Let the kids read for fun! Set up reading programs and incentives. Don’t let those books collect dust! Use them! This topic will be expanded in further posts. At the moment, in one of my schools, we are sorting, labeling, and displaying the library books. We have also devised a system for making sure books are respected and put back where they belong. This year, a major focus for us has been working on literacy and independent reading. We have been learning about and implementing a reading system called, “The Daily 5” which teaches students the skills they need to be independent readers and writers. But what is the use of this? What good does independent reading really do for our students? Well, according to the 2009 PISA results the answer is clear. Teaching children how to find the right books for them, how to improve their literacy skills, and how to read for “fun” is imperative to reading performance. For more information about “The Daily 5” please return back to this blog for follow up posts or check out http://thedailycafe.com. One of the most potent struggles teachers have, all over the world, is that of classroom management. There is so much information floating around about rules and routines, what works and what doesn’t. It’s hard for those who are used to rote teaching and discipline to decipher what might work for them. Especially for those for whom English is not their first language, it can be difficult to decide what is going to work. The website, wholebrainteaching.com introduces a set of rules and routines that are so simple and easy to follow they are basically fail proof. For myself, since I barely go into the same class more than a couple times, the 5 rules have been like magic in forming a classroom management system that I can use in classes that I may go into once and never again. For the teachers who use it regularly, I review the rules for approximately one minute and then move on with the lesson. Rule #2: Raise your hand for permission to speak. I do the typical, “Teacher!! Teacher!!! !” and ask the kids if that is (show my thumbs up) good or (thumbs down) not good. They usually catch on quickly. Then I give a good example. Rule # 3: Raise your hand for permission to leave your seat. I give examples of getting out of the seat and running around the class as bad examples. They usually find it pretty funny. Then I show good examples and model language for asking permission. Rule #4: Make smart choices. This is one of my favorite rules to give bad examples for. It’s the most abstract of the rules, so it is important to give concrete examples. I sit in a chair and tip it backwards and ask (thumbs up) smart or (thumbs down) not smart. Then I pretend to pick my nose and ask the same thing. I pretend to get in a fight with one of the kids and ask again. Then I show good examples (reading quietly, writing quietly, raising my hand, etc.) Kids catch on quickly. Rule #5: Keep your dear teacher happy. I put on a cheesy smile and ask, “Is your teacher happy?” They say, “Yes!” then I do various sad and angry faces and ask the same thing. “No!” They say. Then I explain the scoreboard (will explain more in the next post) and tell them as long as the teacher is happy then they will get happy faces on the scoreboard. If teacher is not happy, they will get sad faces. This all seems like a lot, but the first time teaching it will only take about 10 minutes in an ESL classroom. The many miming actions and the simple language makes it very easy to teach, and easy for them to follow. It is extremely important to enforce the rules. When a student is not following one of the rules, remind them of it by asking, “What is rule # ___”? At first ask them to give you a good example of the rule. In the future you will just have to ask the question and they will get it. In time, the classmates will “spot check” their friends. The key is to enforce them every time. Unit planning is a struggle. It has been one of our focuses, and each teacher has had to plan 2 units for a teacher’s guide that I will publish at the end of august. We are using this unit planning guide which I made from taking ideas from here and there. IB unit plans inspired a lot of it. 1. What percentage of the class met the objectives? 2. Which parts of the lesson went well? 3. Which aspects need revision? 4. Which student’s participation stood out? 5. Which student’s need extra guidance? a. How can we help them catch up? The first question gets us thinking about the class as a whole. Did we get done what we thought we would? Then we get thinking about what specifically went well, and what needs work. Finally, we look at individuals. Are only a few students really participating? Why is that? Which one’s need extra support and how can we do that? This form has worked the best for me. I ask teachers to use it when observing my demo lessons, and I use it when observing theirs.